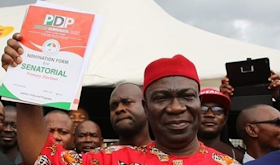 Senator Ike Ekweremadu, deputy Senate chairman, has thwarted speculation that he is leaving the People's Democratic Party. He reassured his support that he remained a member of the opposition party. Ekweremadu said this in a statement on his Facebook page. The Senator wrote, "I am currently out of the country due to a planned engagement." Over the past 24 hours, I have been inundated with calls from friends and political allies seeking information about the rumors of my resignation from the People's Democratic Party (PDP). who have dominated the media, have asked. "Let me know that my path in politics is in the hands of Almighty God, who was indeed very faithful and merciful to me, and I am very grateful to God for that. "My vision in politics is a system that works for everyone, a social and political environment in which everyone, every section and every tribe, not only counts but counts, and as leaders we have to be aware of that, because every system built on something will have less stock. "I am grateful to you - members of my family, my friends, political allies and admirers throughout Nigeria and beyond - for your unusual concern, and indeed I am honored by your kind words of solidarity and support. "Please be assured that I am still in the PDP."